from Mstera by S. O. A cute heart-shaped box. Three colorful flowers in the center are surrounded by a multitude of smaller pretty flowers and leaves. The bouquet is highlighted with gold strokes. 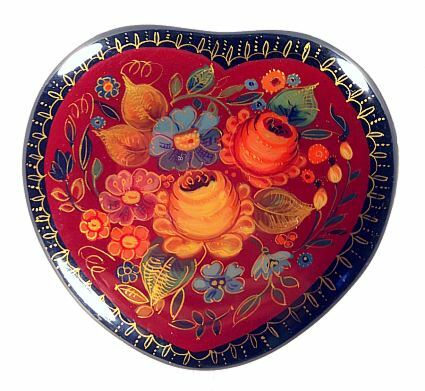 The bright composition is set against red background and decorated with a simple golden ornament. Another golden ornament surrounds the sides of the box. The box is made from papier mache. It sits flat with no legs and opens without a hinge. The interior is red. The bottom is signed with artist's initials, name of the composition, and village.